If a liposome preparation is placed in a sensitive calorimeter and the temperature slowly increased, it is observed that the liposome preparation absorbs a significant amount of heat at a temperature characteristic of the PL which compose the liposome. This is analogous to what would happen if solid water was heated. At the melting point of water, an increment of heat is required, the heat of fusion, to break H-bonds and cause melting. Likewise the heat of vaporization is measured when H-bonds are broken on the liquid-gas transition. These transition are associated with non-covalent processes, namely, breaking H-bonds. Graphs of heat absorbed (Q) as a function of temperature, or heat absorbed/T (i.e. the heat capacity) vs temperature are shown below for the melting and evaporation of water, and for liposome transitions. The transition observed with liposomes is caused by conformational chains in the packing of the acyl chains of the PLs, as the acyl chains change from trans to gauche conformations. These change involve not the simple translation of lipid molecules within and between bilayers but rather the movement of atoms within the molecules. These kinds of motions can be modeled using molecular dynamics simulations. 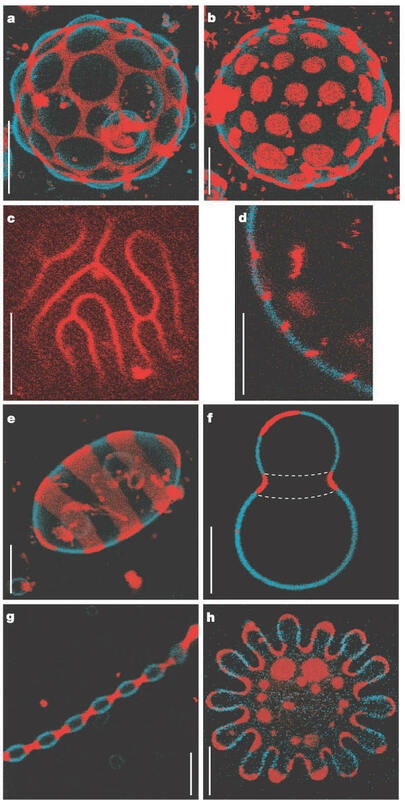 Before the transition, the acyl chains are more tightly packed in the gel phase, and after they are less tightly packed in the liquid crystalline phase, since many chains are in the gauche conformation. The midpoint of the phase transition is called the melting point, Tm. Vesicles in the liquid crystalline phase are more fluid, dynamic, and hence more permeable. Note that the liposomes have not been destroyed but simply have undergone a phase change, much like ice turning to liquid water. Liposomes made of different PL have different Tm. 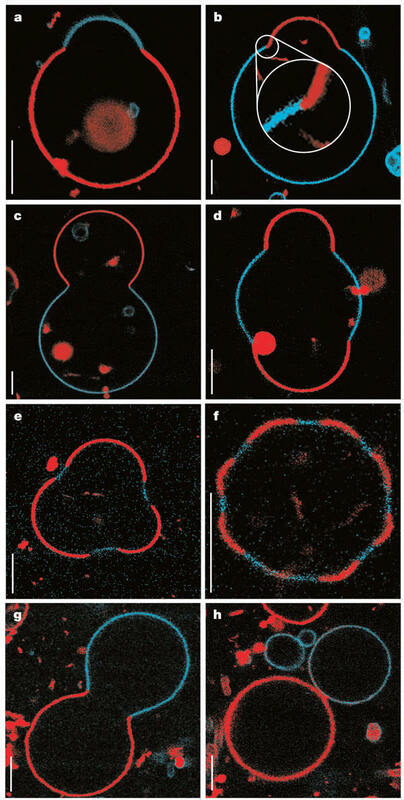 Vesicles make from PLs with bigger head groups have a lower Tm, since they are less "stable". For example, the Tm for vesicles of di-16:0 versions of PA, PE, and PC have Tms of 67, 63, and 41 degrees C, respectively. Cholesterol is also a ubiquitous component of animal cell membranes. Its size will allow it to fit into either leaftlet with its polar OH pointed to the outside. One function of cholesterol in membranes is to keep the membrane fluid at any reasonable temperature. When a membrane is at a temperature less than the Tm, it is ordinarily in a gel, not liquid crystalline phase. The cholesterol helps prevent ordered packing of the acyl chains of the PL's, which increases their freedom of motion. Hence the fluidity and permeability of the membrane is increased. At temperatures greater than the Tm, the rigid ring of cholesterol reduces the freedom of the acyl chains to rotation, and hence decreases the number of chains in the gauche conformation. This decreases the fluidity and permeability. Check out the following dynamics simulation of a bilayer membrane, which gives a clue into the way in which solutes could cross a membrane bilayer.